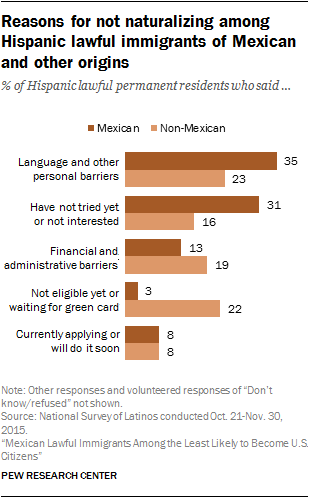 As of 2015, the naturalization rate for lawful Mexican immigrants trailed that of green-card holders from the Middle East by 42 percentage points (42% vs. 83%), and was 33 points behind green-card holders from Africa, 74% of whom had naturalized by 2015. Middle Eastern immigrants had the highest naturalization rate among all immigrant origin groups, while African immigrantssaw the highest increase in naturalization rate in the last decade. 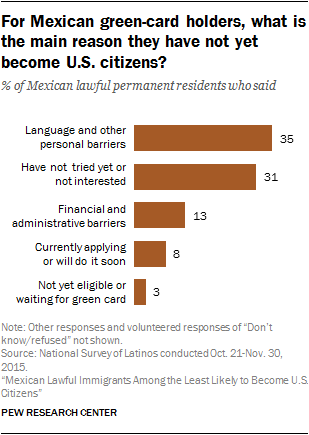 Early signs are that 2017 could see an increase in the rate of naturalization of lawful permanent residents. 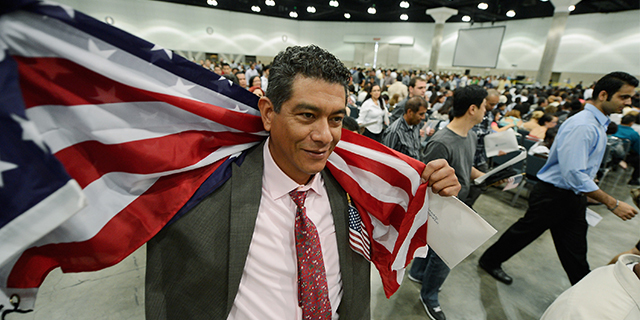 According to the latest figures released by the U.S. Department of Homeland Security’s Citizenship and Immigration Services, there were 525,000 naturalization applicationssubmitted during the first half of fiscal year 2017, which started Oct. 1.3 That number is up 21% from the 435,000 applications submitted in the same period of 2016, which already had seen a spike on naturalization applications compared with previous years. 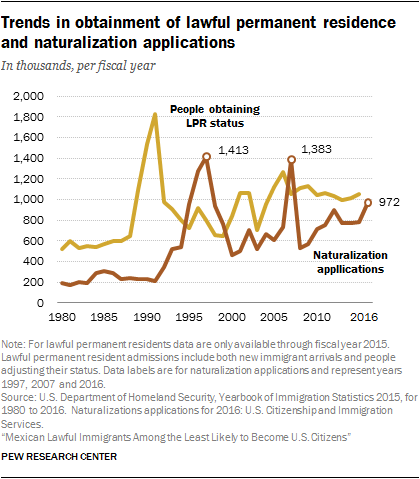 The total applications for fiscal 2016 were up by 24% compared with 2015, and represented the highest number of applications for naturalization since 2008. Meanwhile, the number of lawful permanent residents admitted since 2010, many of whom would have recently become eligible to apply for citizenship, has stabilized at around 1 million per year since 2010.